Glen and Steve Thistlewood share their lifelong research on Carnival Glass, its manufacturers, social history, and varying shapes, patterns, and colors. Based in England, Glen and Steve have recently completed a new book, Carnival Glass: The Magic and the Mystery, for Schiffer Publishing. They can be contacted via their website, Carnival Glass Worldwide. Our newest book is actually the fully revised and expanded second edition of our first book. It came out originally in 1997, but needed a lot of updating because we’d done so much research since we wrote it. There was such a huge amount that needed to be brought up to date, so the publisher, Schiffer, allowed us to revise and expand it. We do a lot of cutting edge research into Carnival Glass – things people haven’t discovered or written about before. There are more photos, more writing, and all our latest research in the new edition. During our research, we found more manufacturers in Europe and India. One of the things that Steve and I took on when we started researching Carnival Glass was production outside of America, which was believed to have occurred much later than the first American production. 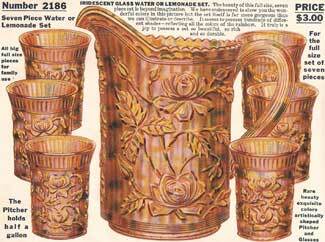 We termed American Carnival Glass “Classic Carnival Glass,” this came on the market in 1907. It was previously believed that Carnival Glass production in Europe, Australia, and Scandinavia took place in the late 1920s and early ‘30s, after the production of Classic Carnival Glass, but we found out this wasn’t the case. In fact, Carnival Glass production took place in Europe as early as 1915, and possibly before that. It was actually running in parallel with American Carnival Glass, no doubt inspired by the success of early American Carnival Glass. We’ve traveled all over Europe and Scandinavia, doing research. We discovered major manufacturers in Czechoslovakia, England, and Poland, and managed to put names on maybe 10 or more makers in India. It really is astonishing how much Carnival Glass was made. It’s almost a reflection of social history that started around 1900 and goes until today. It’s like holding a mirror up to people all over the world. Because it was such a popular glass, it was in people’s homes; this wasn’t something that was admired from afar. It was accessible to people. They were able to go out and buy it, and in many cases it was even brought to them on mail order. People used it and decorated their homes with it. Marigold, one of the most popular colors, was so vital in people’s lives because it brought color; this wonderful splash of gold into homes that at that time were probably very somber with dark oak furniture. Collectors Weekly: So Carnival Glass was accessible to people of all social strata? Glen Thistlewood: Absolutely. The first actual use of iridescence on glass we can be pretty sure of was in Bohemia in 1856 and the maker was J & L Lobmeyr. According to the story, by using fireworks in a furnace where some glassware had been placed, the metallic vapors of the fireworks produced iridescence on the glass. The concept was developed and iridescent glass caught on. Iridescence can be seen on ancient Roman glass but that wasn’t a deliberate effect, as it was caused by the glass being buried for centuries in moist and often acidic soils. Louis Comfort Tiffany then picked up the whole idea of iridizing, and his wonderfully decorative but expensive glass was then copied by makers such as Fenton, Northwood, Imperial, Millersburg, and Dugan-Diamond. They were making it for literally cents. You can look at some of the old adverts in the catalogs. People were able to buy it really cheaply and could use it in their homes. Steve Thistlewood: Art glass makers were making individually hand-crafted, one-off pieces and then charging very handsome prices for them. American factories were able to design processes to mass produce pressed glass that had the same effect using modern technology, so they could produce very large quantities at a very low cost. It was very much a mass-produced glass for the masses. Glen: A hand-operated, side-lever pressing machine, which pressed molten glass into metal molds, was used to make Carnival. By this method, they were producing much cheaper glass instead of blowing it one piece at a time. They packed the glass into wooden barrels, loaded them onto riverboats, and distributed them all over America. 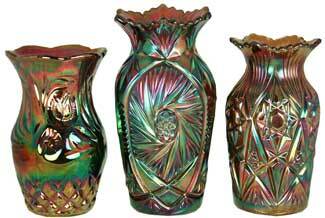 Carnival Glass was also exported to destinations such as Europe and Australia. We have contemporary adverts from British journals from around 1911 that show importers in the United Kingdom bringing Carnival Glass that was made in America. 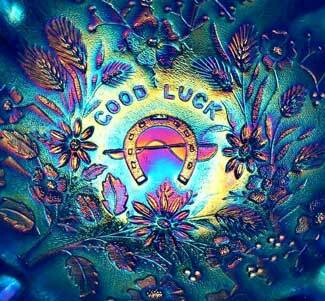 In fact, we even speculate that one of Northwood’s early American patterns, the Good Luck pattern, was probably bought in the United Kingdom during the First World War to give people a good luck talisman. It had “good luck” and a horseshoe on it. It was such an accessible glass; it was a part of people’s lives. In the early years, Carnival makers took the fashionable styles – like the craze for all things Oriental or the Arts & Crafts and Aesthetic Movements, for example – and used them for their patterns. To have immediate appeal to the housewife, they would take the patterns that she would have seen in the fancy shops or on wallpaper and on fabric and put them on a cheap bowl or plate. That was a really clever touch. Carnival also took inspiration from the early cut glass patterns. These cut patterns were translated into pressed glass designs which were then, in turn, also made into Carnival. Things that were popular in one form were then taken over and used in another form. It didn’t just stop with Oriental, Art Nouveau, and Arts and Crafts influences. It moved on into Art Deco as well. There are some fantastic Art Deco Carnival pieces made in Czechoslovakia with classic shapes, lines, and zig zags. We have one called the Seagulls Vase. It’s breathtakingly beautiful. That’s all written about and photographed in the new book as well. Collectors Weekly: How long have you been collecting Carnival Glass? Glen: I think Steve and I have actually been collecting for nearly a quarter of a century. We started in the 1980s. For nearly 10 years before our first book was published in 1997, we self-published a quarterly journal on Carnival Glass called NetworK. We also wrote a lot of articles and did a lot of lectures. We used to collect pressed glass. We had two little children at the time and we would go out to flea markets and pick up little bits of pressed glass. Steve: One day we went into an antique fair and there was one huge booth of very highly colored iridescent glass, which we found out to be Carnival Glass. There was one dealer who had a big display of this glass for sale, and he got our interest by explaining a little bit about it. It immediately hooked both of us, and that was that. From that point onwards, we just went here, there and everywhere to find this glass. Glen: We were completely transfixed by it when we saw that booth, and we just both fell in love with it. We used to wake our children up real early and take them out hunting for Carnival Glass. They got really proficient at identifying pieces. Our daughter is probably more interested than our son. She has a few pieces, but she prefers to keep them in our home where they’re safe. She particularly loves Northwood’s hearts and flowers, which is a beautiful pattern that was inspired by embroidery stitches. Collectors Weekly: How do you determine the value of Carnival Glass? Glen: It depends. You need to read the book and join the clubs. Education is key to naming the value and being able to spot the piece that somebody else won’t have a clue about. The highest price paid so far at auction for a single piece of Carnival Glass was $100,000 in 2006 for the People’s Vase made by Millersburg. It’s a very rare piece. After that, the highest price I can recall was for a Northwood Grape & Cable punch set in aqua opal that sold for $95,000, I think. Steve: On the other end of the spectrum, you can get pieces for literally $1 to $5. Glen: This is what fascinates people about Carnival Glass. We called our first book The Magic and the Mystery and that just sums up the whole thing. Again, this is why you need education. The mystery isn’t just finding out things through research; it’s also knowing your patterns, your colors, the little things that not everyone is going to know that enables you to spot a piece that’s worth a lot and pay very little for it. It’s happened to us quite often. We were walking around an antique sale in London maybe 10 years ago, and I saw an aqua opalescent Northwood plate. It was on sale for about $50, but I knew it was worth something like $2,000 or $3,000. I haggled a little bit because you have to, and eventually I bought it and walked away with a face like a ghost. That was our best bargain. You get far more enjoyment out of it when you understand the history behind the glass. 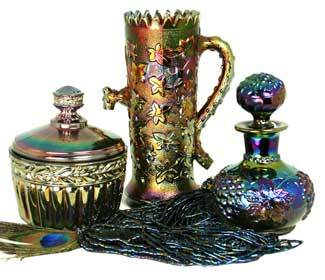 For example, Carnival Glass has many names. One of them is baking powder glass, because you would buy baking powder and you’d get a piece of Carnival Glass for free. Collectors Weekly: On your website you have a huge list of names of manufacturers. Is that a complete list of names? A Magpie 5 inch berry bowl (also called a nappy) in purple Carnival from the Australian maker, Crown Crystal. Glen: Actually, there are several more manufacturers that we reveal in the new book – we have discovered them through our recent research. There are also, interestingly, a lot of names for Carnival Glass itself, some of them were from the early days in 1910 or 1911, and then others are the colloquial names that crept into everybody’s vocabulary as time went by. Then, of course, there are different names for Carnival Glass in other countries. In Finland for example, it was known as Myrkkylasi which literally means poison glass! They put arsenic in the glass batch when they made it, and the workers who made it were affected by that. Steve: A lot of the metals they used to create the iridescence were heavy and poisonous metals. The glass workers were breathing in these fumes every day of their working lives, so the life expectancy wasn’t that great in the glass factories. Glen: The name “Carnival Glass” came about when surplus stock around the late ‘20s and ‘30s was used as fairground prizes at carnivals. The name just stuck, probably because it sums up the colors, the vibrancy and the excitement of the glass. You’ll find most Carnival Glass collectors are not boring people. We have conventions, parties, and all sorts of things all around the world, and you can bet they’re always going to be a lot of fun. Collectors Weekly: Where in the U.S. was most Carnival Glass produced? Glen: In the Northeast – the Ohio valley and West Virginia, really. That’s where the main manufacturers were located. Steve: One thing we found out through our research was how people moved from one factory to another, which started to explain why some of the styles were so similar. We were able to trace the movement of some key people. I think if you go back a step before that, you’ll find connections between families in Europe who went to the U.S. and started making glass with a lot of the skills that they had originally had in the UK. Collectors Weekly: Did Carnival manufacturers mark their pieces? Glen: The only classic U.S. maker who marked his glass was Northwood. He marked it with an “N” underlined in a circle. Steve: He did it as a sign of pride. He made a point of signing a very large proportion of his output, but having done that, he sort of opened the way for people later on to forge it. Glen: That’s caused a lot of trouble in the past. There have actually been reproductions where certain makers have used an “N” but didn’t quite close the circle around it or they put a little squiggly bit up the side. They call that the Wobbly N.
In the late ‘70s into the ‘80s, there were some American made reproductions. They made Grape Delight and some table pieces, and they were marked with an “N” in an almost complete circle. One of the Carnival Glass clubs went to court to stop the misuse of that trademark and they actually protected it by acquiring it legally. You can read all about it in our second book, A Century of Carnival Glass. One of the problems in the last 20 or so years for newer collectors has been that fake Northwood pieces are coming in from the Far East – Grape and Cable, Peacocks, and Good Luck – with the N on the base. You still see fakes appearing. They flooded into parts of the states in the ‘70s. More recently there have been some fake Australian pieces that came out – a kangaroo and a kingfisher. You can find out ways to spot all these fakes on our website. One of our lines of research has been to help collectors find ways to spot modern reproductions or fakes. They’re not necessarily the same thing. Some reproductions are genuine and they’re great pieces to buy as long as you’re not paying top price or buying it thinking it’s an old one. 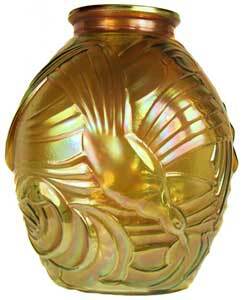 For example, there’s the Mary Ann vase that was originally produced by Dugan and has been reproduced. They’re beautiful and collectible. We’ve got an inexpensive, modern example and I love it; it’s absolutely gorgeous. It’s sold quite freely and openly as a modern piece. One way to differentiate between the old and new is to look at the base. On the modern vase, it’s iridized all over, but on the old one, because of the way it was made, the base is not iridized. Steve: Other than Northwood, other manufacturers didn’t mark their glass, and obviously that makes it more difficult to collect because there isn’t something obvious you can look for. That’s when the knowledge of the patterns, colors, and styles comes into it. Collectors Weekly: What are some examples of popular patterns? Glen: There are probably about 2,000 patterns, but it’s upwards and rising. Steve: Some things that are always popular. Peacocks is probably the number one. There are a lot of different patterns that feature peacocks. Colors too will often help you home in on the maker. 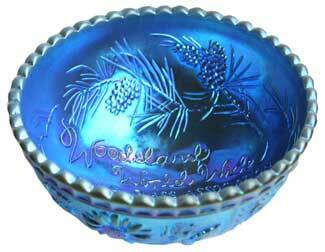 For example, aqua opalescent Carnival was mainly made by two manufacturers: Northwood and Fenton. Refining that further, most aqua opalescent Carnival was made by Northwood, so should you find a piece, then straight away you’d be thinking Northwood. To help further, there are other characteristics about Fenton’s aqua opalescence that would enable you to distinguish it from Northwood’s production. It would be impossible to even try to give you a list for everybody, but there are little clues for each maker. Imperial made a lot of geometric glass, and they made a very vivid beautiful pumpkin marigold, but having said that, other makers have made geometric glass and pumpkin marigold, too. You’re almost like a forensic detective sometimes. You’re picking up clues here and there. Collectors Weekly: What are some of the regional differences among Carnival Glass makers? Glen: They can be summed up in quite generalized terms, which doesn’t allow for the sophistication or complexities. In the past, for example, people would say that the European makers only made two colors – marigold and blue – but we’ve discovered that’s actually not true. They made lots of other colors, like purple, smoke, milk glass, and on and on, although not as many as the Classic American makers. Another broad distinction is that glass from Australia mainly comes in two colors and often has Australian flora and fauna on it, so if you find something with a kangaroo or an emu, it’s from Australia. Generally, their glass is in two colors. They used to call it marigold and dark. They also did a pale blue and a pale pink, but those are scarce colors that were probably not in the line. European Carnival Glass often has a ground base, which you generally don’t find on American Carnival Glass. Also, quite often on European Carnival Glass, you find the pattern is intaglio rather than cameo. That’s not true in all cases, but more than you’d find in the United States. It’s a generalization, so you need to look at more details than that. Steve: There are always exceptions to those rules. If you interpret them as absolute gospel, they’re going to go wrong, because you’re always going to find a piece that breaks that rule from one of the other manufacturers. Let’s say the piece has a ground base. Usually that’s going to be characteristic of European production, so it starts to narrow it down to maybe 85% probability. Then you look at other things, like the color or the pattern – is it geometric? Is it floral? You can make up the other 15% of the probability by the other features. Glen: There were some Carnival shapes Europe produced that America didn’t and vice versa. For example, the American table set has four pieces, but the European set usually has three pieces, sometimes just two. The American table set will have a covered sugar, creamer, covered butter, and the open spooner. Two –piece sets in Europe just have a sugar and creamer, and the three piece sets have a covered butter as well, but there is no spooner. It’s just not a European thing to do. Collectors Weekly: Is there a specific shape or piece that’s really popular to collect? Steve: Plates always seem to be very collectible, partly because they seem to display the pattern very well and they hang well. There are always miniature collectors who will pay a lot of money for unusual miniatures. Another thing is single tumblers. They don’t take up a lot of space, so you can display them. If you want to show lots of different patterns, tumblers are a good way to do it. Glen: Vases are very collectible. They also display beautifully and don’t take up too much room. There are so many of them. You can get them to represent virtually every country in the world. Then for those who have more room available, there are the big showy pieces, such as punch sets. If you click through our website to the article on color, you’ll see a photo of some truly gorgeous punch sets. The photo of those punch sets was taken at a convention that we organized in 2004 in St. Louis. The year before that, we helped co-ordinate a presentation at a Carnival Glass Convention: the title of it was, “If a Picture is Worth a Thousand Words, What’s a Thousand Pitchers Worth?” The aim was to get 1,000 Carnival Glass water pitchers to display. We didn’t quite make a thousand, but we got about 700 or so. It was astonishing. People brought pitchers that were made in India, Finland, Germany, Czechoslovakia, South America, and, of course, lots and lots of amazing and often very rare and beautiful ones from the United States. Collectors Weekly: What were the main objects and forms that were made out of Carnival Glass? Steve: Almost anything you can think of. From the standard shapes and sizes of plates, bowls, and vases to functional shapes like table sets and water sets. There are novelty shapes, lighting shades, gas shades; the range is just endless. I think the glass manufacturers thought that if there was a shape that could be made in glass, then they would make it in Carnival glass. Glen: Then there were dressing table sets (boudoir sets) too. 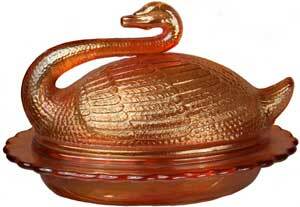 Northwood made his well known Grape and Cable pattern in a beautiful dressing table set with a dresser tray, a little pin tray, hatpin holder, colognes, and powder jars. Also, Inwald in Czechoslovakia made some stunning dressing table sets. 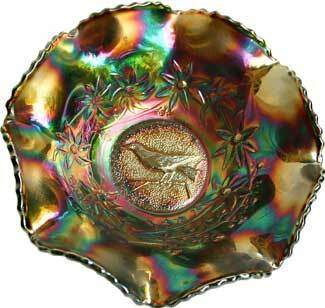 Carnival Glass also falls into tobacciana – for example, a pipe humidor, ashtrays and cuspidors. There’s also Carnival Glass jewelry, Carnival Glass buttons, Carnival Glass hat pins. Pressed glass is so versatile. If you want to collect candlesticks too, there’s a wide and varied range in Carnival. One rare example is the Jesus Candlestick, made by the German factory Brockwitz. It’s the most amazingly detailed modeling of the figure of Christ with unbelievable detail down to each tiny toe. It’s quite breathtaking. Steve: That’s part of the popularity. Certain types of Carnival Glass fall into other categories of collectibles. You don’t need to be a Carnival Glass collector to find some elements of Carnival Glass appealing, because they can fit into your collection. Collectors Weekly: Do you focus on anything specific for your personal collection? Glen: We like to have something of everything. We’ve tried to get something from every manufacturer in every color we can afford and in every shape we possibly can. Pretty much all of the glass in our books has been ours, but some very kind collectors have let us photograph theirs as well or given us photographs. Steve has a rule: “You can have another piece if you can find room for it.” And, you know, I can always manage it somehow! We have Carnival Glass everywhere in our home. Steve: There’s no point in having it and just putting it in a box somewhere. Glen: We like to bring some Carnival out when we entertain . We use punch bowls, although we don’t use the most expensive pieces; we use the more recent ones made in the 1970s by Indiana glass. We also bring out our goblets and glasses and things like that. I’ve got a stack of three European cake plates. They’re on pedestal feet and they’ve got a flat part where you can actually place a cake very easily. They’re wonderful things to use because they’re not expensive to pick up; sometimes they’re even cheaper than a new piece of glass at a store and they display the food so attractively. We also use vases. If you buy some of the beautiful new ones that Fenton make they look wonderful with flowers in. There’s just something about putting flowers into vases with iridescence; it looks gorgeous. Collectors Weekly: Does Fenton still use the old, traditional patterns today, or new patterns? Steve: In the United States, Fenton is still going, and they’ve revived a lot of their older patterns. They’ve started to remake them and put the Fenton mark on them so you can generally tell the new pieces from the old. They would revise old patterns and old molds, and as other companies went out of business, Fenton would buy some of the molds that were put up for sale. They have molds that were originally done in the early period by other factories and they have their own mold makers who can cut new molds to match new styles. Glen: One of the things that Fenton has been good at is producing commemorative souvenirs for the Carnival Glass clubs. Ten years or so ago, I designed two patterns (the interior and exterior) of a commemorative piece for WWWCGA, the internet Carnival Glass club. It’s known as the “Woodsland Pine” and Fenton has now made that in about 10 different issues, one each year. The cleverness of Fenton is they can make this piece – it’s actually in the shape of a small bowl that is about five inches across – but they can shape it into other forms. For example, they have spun it flat into a plate, they’ve put handles on it, they’ve pinched the edge, they’ve ruffled it, they’ve done all sorts with it. They’ve used different colors too, of course. The decorators have painted some and I’ve painted some as well. The multiplicity of different colors and shapes that we’ve achieved from that one mold is amazing. Frank M. Fenton died a couple of years ago. He did so much for the Carnival Glass clubs. He’s missed on a daily basis by a great many people. Steve: Seeing the mold-making process and the skill and ingenuity of the mold makers was impressive. With Fenton, we were dealing with modern tools, modern equipment, computer-assisted design, and so on. You think of the early designers who were making exactly the same thing but with a hammer and different shaped tools. They didn’t have computer-assisted design. They didn’t have tools that would cut a piece from a computer model for you. Collectors Weekly: What are some current trends in Carnival Glass collecting? Steve: Trends come and go, but certain things that are there all the time – certain colors, patterns, manufacturers that are always in vogue. Rarity is a big factor. If there’s only two or three or half a dozen examples known, it’s going to be highly desirable. There are certain colors like aqua opal that always seem to be desirable. There are certain times when the pastel colors are very, very popular, and then they wane and some of the darker colors, particularly with electric iridescence, take over. Glen: A hot trend currently is emerald green. Also, more people are looking to get European Carnival now as well. At first it was rather pricey because there wasn’t much of it around, but the Internet has opened up the world so much and people can easily access it. It’s more collectible and more available now. Steve: People are increasingly expecting to find the perfect piece. You see pieces with very poor iridescence and they don’t hit the high prices. People are collecting for good quality iridescence, good quality color, and ideally in perfect shape, although these things have been around for over 100 years now, so it’s not surprising if some pieces have some minor damage on them. Glen: We saw an Orange Tree Loving Cup made by Fenton sell at an auction for maybe 20 times what it would normally bring just because the iridescence was so phenomenal. It was in the most amazing electric blue, and it was so vividly iridized that it really looked as if someone had plugged it into the electricity outlet. The quality of the iridescence is what counts and that trend is going to be there for a long time. Collectors Weekly: Is Carnival Glass collecting growing? Steve: Carnival Glass just had its 100 year anniversary, so I suppose it’s a true antique now, which must increase the appeal with different sorts of collectors. Glen: I think high prices can frighten people if they don’t realize that you can also buy lovely examples for very reasonable prices. When you understand the history, what it represents, the people who made, designed and sold it, and the journey it’s taken throughout its life, it all adds so much more to the glass. And the history is the same whether the piece is expensive or not. It might be a common pattern and very available. It doesn’t need to cost a lot of money. You can have a collection of Carnival Glass that doesn’t cost you the earth but is still representative of 100 years of social history. It’s fascinating. Steve: There are a lot of closet collectors of Carnival Glass. We come across them from time to time as people see the website and email us. They say, “I’m not in any Carnival Glass clubs, but I’ve got a lot of stuff.” There are quite a lot of people like that who never admit they collect. The Internet has opened up communication from those people. Glen: The Internet has changed things. People may not join a formal club like in the past, because in the past the only way to contact people was to join a land-based club or convention. Now they tend to contact through email. Steve and I were remembering when we first started collecting Carnival Glass. We could go to fairs and flea markets, but soon we wanted more than we could get here in England. We wanted different pieces from the U.S., and that was almost impossible. We’d spend a fortune on phone calls and writing letters and having pieces shipped overseas. Now you can go on eBay and with a couple of clicks, you’re done. Mind you, we gained a lot from having to jump through all those hoops, it made us travel around the world, and in doing that we learned so much. It put us out there. We’ve gone to conventions, been to clubs, and done talks all over the U.S. We’ve worked in Fenton’s factory. We sat in Frank’s office with him. We were privileged enough to go through all of Fenton’s records, and we actually held in our hands the check stubs from the early days of the Fenton factory, signed by Frank L. Fenton, paying the mold makers. There is no substitute for holding the original stuff in your hands and knowing that before you, the hand that held it was the hand that made that glass 100 years ago. That’s a real experience. Of course, once you start doing that and you’re actually getting your hands dirty, you’re hooked on it. Steve: It’s almost too easy to go onto the Internet and look at pictures rather than having the experience of actually holding it. If there are 2,000 or so patterns, 60-plus colors, and 40-odd manufacturers, and then you combine all of those with all the different shapes they made, it’s just overwhelming. How do you start to make attributions if you haven’t been out there and handled it. Glen: I do think the Internet inspires people by showing what’s available and opening their eyes to what is in other countries. It’s opened up parts of the world that previously we were unable to communicate with. It has exposed areas of education and research. We have been able to communicate with not necessarily just carnival collectors but other glass collectors. It’s really pushed back the boundaries , as long as you don’t just sit back and let it all be done for you. It shouldn’t be passive. The best way is to always make it active. Collectors Weekly: Are there a lot of Carnival Glass collectors clubs? Glen: Yes. One would be WWWCGA , where Steve and I are the Educational Advisors and I am also the weekend Mailing List Editor and immediate Past President. We’ve been in that since it started in 1996. It’s the world’s only Internet club, not land-based, with members mostly in the U.S. But we also have members in Canada, the U.K., and Australia. We send out a daily mailing list on Carnival Glass, day in, day out, without fail. I do it on the weekends and my co-editor, Brian Pitman, does it on the weekdays. We only stopped on one day – September 11, 2001 – but every other day we’ve sent it out, which is quite an achievement. There’s a club in England called the CGS UK. We often do talks and write for them. They have a paper newsletter that comes out four times a year. They’ve been going a long time; 26 years now, I think. They’ve done an awful lot of education work. It’s obviously much smaller than the U.S. one, because the UK would probably fit into a half of Texas, but nevertheless, it’s a very good club. In the U.S., there are some other very large clubs such as ICGA, (the International Carnival Glass Association), HOACGA (the Heart of America Club), and ACGA (the American Carnival Glass Association). Those three are land-based. They do have members around the world, but they are predominantly American. Steve: There are some great regional clubs too, such as the SSCGA in Florida, the Texas Club, New England, California, Pacific North West, Air Capital and so on, as well as clubs in Australia like the CGCAA. You’ll find people will be members of more than one club. There’s a lot of duplication in the membership. Glen: There are also several clubs in Canada. One is bilingual, French and English. In Sweden, there’s an Eda collectors club. Eda was a Swedish Carnival Glass maker in the 1920s. Eda glass has a very strong collector following, many of whom collect what they call lyster glass, which is their name for Carnival Glass. They have a beautiful museum set up the way it looked when the factory was in operation on a very small scale. They have beautiful showcases full of Eda glass and some stunning Carnival Glass. It’s very sought-after, high quality, beautiful glass. Something’s hit me that I’ve got to say – the unsung hero of the Carnival Glass movement from the beginning right the way through was the mold maker. We look at the glass maker and, yes, I’ll herald the glass maker because they are so skillful and create such beauty. But when you look a piece of Carnival Glass, at the intricacy of the work and the pattern, you realize that somebody thought that pattern up and cut it in reverse onto a metal mold that’s curved. The skill of that is absolutely breathtaking. So they are the unsung heroes, the mold makers, and mostly we can’t even give you their names, with the exception of Hipkins Novelty Mould Shop in Martin’s Ferry. Just recently, for this latest revised edition of our book, we’ve also for the first time put a name to the actual designers of some of the patterns. We’re really thrilled about being able to do that. These were certain people in Czechoslovakia – one man in particular, called Rudolf Schrötter. He was responsible for designing entire ranges of Carnival Glass and he would adapt the shape to the pattern. He was an absolute master of design, and it’s wonderful to be able to put a name to something like that, because it gives you yet another aspect of Carnival Glass. We’ve been researching for such a long time now and we’re finding new information continuously. It’s a constant and ongoing exploration. When we recently discovered yet another manufacturer, it was like being able to put the first footsteps on pure white snow. You do feel as if you’re going into places that have never been trodden before. It’s fascinating to be able to do that and to discover more about the people behind it. This fascinating article is very much appreciated. I hope it opens up new worlds for future generations of collectors of antique glass, especially Carnival Glass. We are trying to get rid of some of my mother’s things. She passed, and we would like to liquidate some of her carnival glass. Have one piece that we are very unsure of price wise. It is a dragon Iridecent Carnival glass bowl.Although, it has on the bottom is lines, I understand that that may be from straw. Believe it may be Fenton, even though no real proof. Straight medium round bowl, not fluted. In good shape. Any way was told not many of the dragon pieces were made.Have looked into a lot of articles. Talked to alot of collectors, some of said that it is a rare piece and other have said not a rare piece.Any way have a buyer, who wants it and would like to know of some kind of price range. Love your site., Im looking forward to becoming a member .,thank you very much.when i get the money I will be buying the book on carnival glass…I love it and will like to learn more about it. Karen, if you go to the Show and Tell section and post some photos, I am sure we will be able to help. Hi Verna – the piece you describe sounds like Fenton’s THISTLE banana boat. It has the Waterlily and Cattail exterior and stands on four feet, as you describe. It’s a gorgeous piece of glass and always makes an impact whenever it is seen. Congratulations! I can’t be certain of the colour of the item without a photo, but it’s likely to be marigold from your description. Hold it up to the light and see if you can find a part of the “dropped belly” that you mention, where there is no iridescence. If the glass is clear then the colour is known as marigold. The golden orange coloration comes from the iridescence. The item is Classic Carnival, which means it is “old” from around 1910-1920 or thereabouts. Absolutely fascinating topic. Having been introduced to this feild only very recently, i find that i simply can’t get enough of the colors, rarety, history, the snapshot of normal life of the time that the glass represents. I have an item or two that i have not been able to identify and i was wondering if you would be able to assist in some way? Also, how can i get a copy of your new resource book? Thank you for your time and passion so far already! “ ” They drank, they were not subservient to men in any fashion—not the mainstream model of womanhood.